Media-focused tasks such as encoding a video took less time to complete on an Intel Celeron N3450 processor-powered Chromebook than on a MediaTek processor-based Chromebook. Durham, NC, December 21, 2017 --(PR.com)-- Every day, students use apps to navigate the digital spaces that classrooms have become. 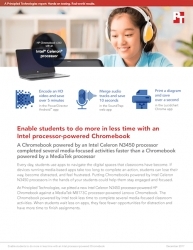 Principled Technologies (PT) compared a new Intel Celeron N3450 processor-powered Chromebook with a MediaTek M8173C processor-powered Chromebook to learn which device could help students complete tasks faster. The Chromebook powered by Intel took less time to finish several media-focused classroom activities, including rendering video, printing diagrams, and merging sound tracks. As an example, PT encoded an HD video over 5 minutes faster with the Intel Celeron processor-powered Chromebook than they could using the MediaTek processor-based Chromebook. To learn more about how a Chromebook powered by an Intel Celeron processor could benefit students, see the full report at http://facts.pt/6KjrrT.